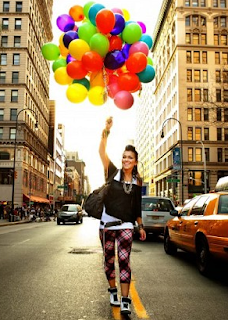 kandeej.com: Big Apple Baby: Meet Me NYC & win something everyday! Big Apple Baby: Meet Me NYC & win something everyday! I'm almost ready to hit the streets of New York City...some people have expensive handbags, furs, or jewelry....I have balloons baby! or as we're gonna make it- Happy Night Out, because you guys will get to come out and I'll get to meet you and hug ya! what: Fashion's Night Out with Sultra and Sephora AND ME!!! come by, see the latest in "HOT" stuff, get a picture, get a hug and meet me in real person-ness! BUCKLE YOUR STYLE and BEAUTY SEATBELTS because I'm about to show you FASHION WEEK like no other! Plus I'll be going to get my hair cut while I'm there so keep watching for my new do'! don't worry my lovie-pie's...all of you that can't come to NYC- you won't be left in the rain...I've gotta way you can "come along" and win some fun NYC things and make-up too! Every day for Mercedez-Benz Fashion Week, the Mirabella Beauty page on facebook will be doing a giveaway of make-up and/or fun giveaway - win make-up....an "I heart NY" t-shirt signed by yours truly! go like Mirabella's page on facebook: MIRABELLA BEAUTY so you can watch fun behind the scene videos with me and win cool stuff!